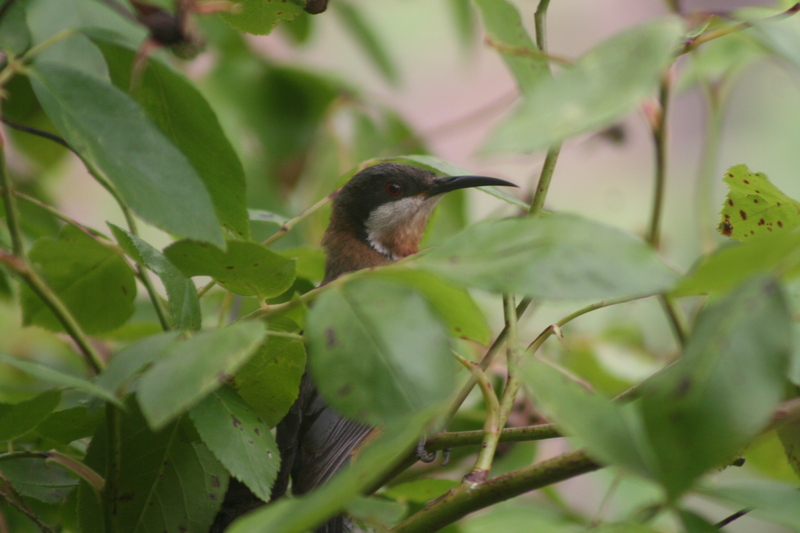 An Eastern Spine-bill is on high alert as it checks to see if anyone is watching! This is one of several species nesting late this season. While having the advantage of many nectar bearing plants and thousands of insects to feed on there is always the risk of summer weather extremes that can kill the chicks or destroy the nest. After laying 3 eggs in a flimsy nest on the outer edge of a banksia rose, just 2 metres from where our dogs sleep, all eggs hatched successfully and the chicks were growing rapidly. But, then along came a thirty five degree day that had the parents desparately trying to provide shade by sitting over the nest. By evening the nearly fledged chicks had spread out from the nest, hanging on to branches, trying to catch a breeze. Only one chick remained in the nest. An overnight cool change saw the temperature drop to 18 degrees with strong wind. Sad news in the morning – 2 dead chicks on the ground below the nest and one hanging upside down lifeless from the nest. I untangled its foot from the nest and felt a little movement from its leg. I remembered the story of “Thumbelina” from Sunday morning radio when I was a kid – something about a swallow that nearly died from cold and how it came back to life with a bit of kindness. So, I carried this little bird in a lightly closed fist, blowing warm air on it for half an hour as I felt stirrings of it coming back to life. Shaving one handed, eating breakfast one handed, typing one handed, I nursed the little Spine-bill all morning. We fed it lightly with a mixture of fresh honey and water during the day and that night I held it warm on my chest ’til morning. 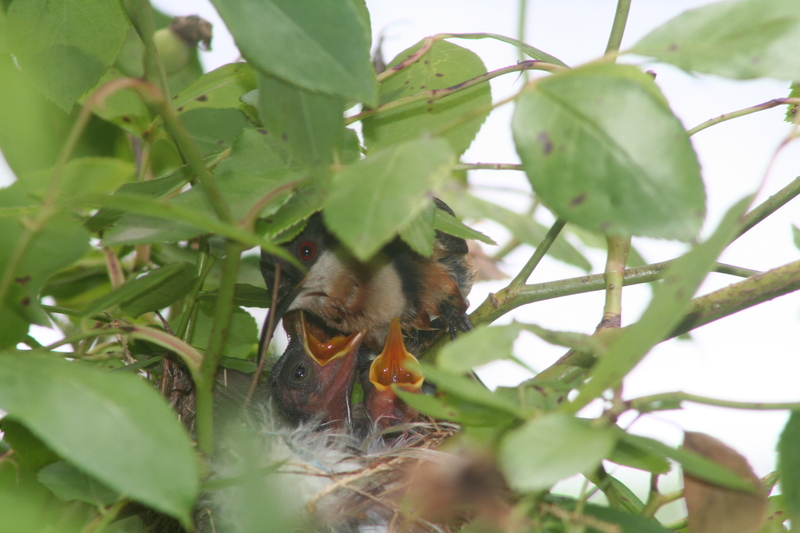 We were excited to see the parents feeding in the shrubs around our house and as the chick was hungry and now quite vocal we thought we would put it back in the nest and observe. Within five minutes the first tentative parent came to the nest and fed the chick. The chick was soon following the parents for more food, hopping through the branches. Later in the day we picked it up off the ground again and put it back in a bush for the night. The next morning it was in the company of the parents again and seems like it will survive and get stronger from here. Fantastic news as we love the sight of the mature birds hovering in front of flowers extracting the sweet rewards with their long tongues.